„Miss Doris, go shopping at Rothdauscher’s, they have the best quality“ recommended my neighbor, 80 years at the time when we talked about where she buys her bedding and blouses. Even later, when visiting her at the retirement home, she would always be impeccably dressed sitting next to her perfectly mangled bed cover. We lost the demand for value and the willingness to maintain this quality that has its price. It started in the 90ies, when the first H&M shops started popping up and made a mockery of this demand for decent fabric and workmanship: Why wearing the same stuff over and over again and bother repairing the clothes or pay more for mending or alteration than you would for a new piece? 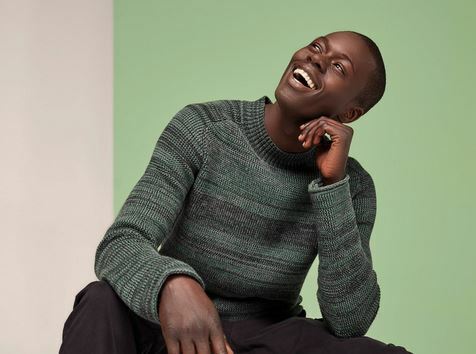 Ms Wenzel originates from a time, when terms like Mako Cotton, Fresco, virgin wool and linen were terms that had their place in the active vocabulary and were a steady component in the quality scale of garments. A time, when garments had their price. They were then already more than the mere coverage of a basic need, no, it had to be chic too, but the decision for or against something new wasn’t primarily led by wanting it only for one night. It had to offer a lot beyond. The quality of a fabric accounted for a large part when deciding for or against a garment. Today we want to talk about this quality. 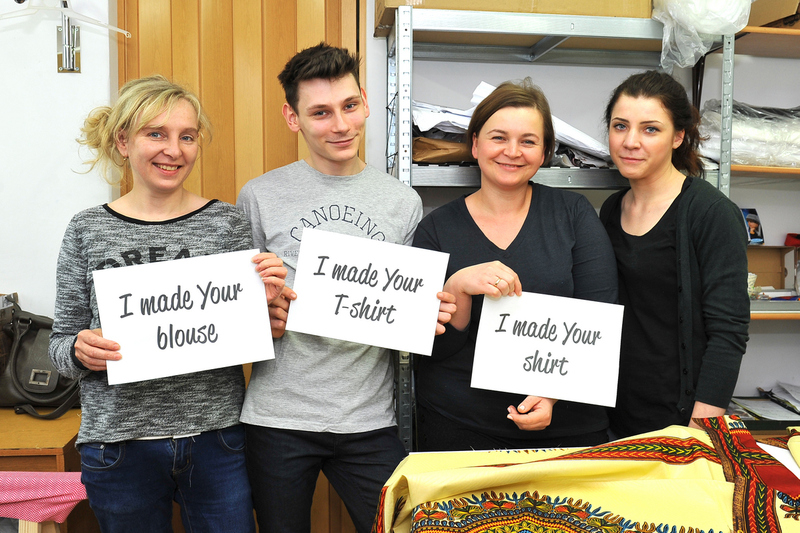 So my focus this fashion week in Berlin was fabric: The high quality AND sustainable fabric. At the Green Showroom and the Premium I talked to a small brand from Krakau, a biologist with a startup and the probably best-known German eco-fair brand about their material innovations. 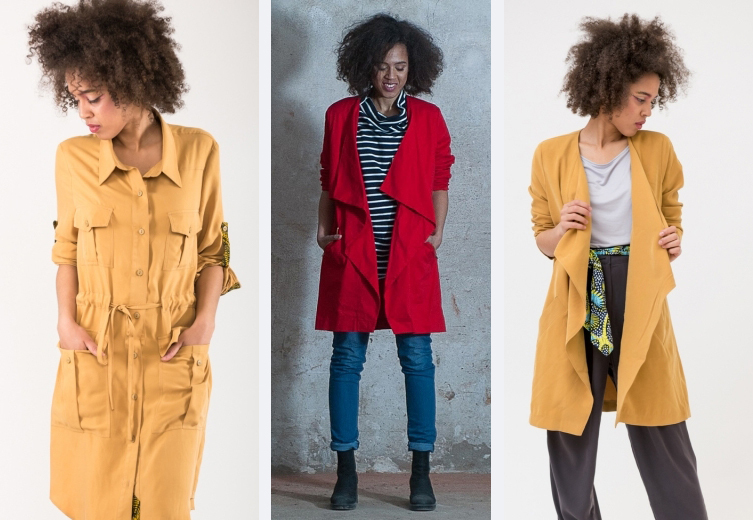 Agata from Krakau, wanderlusty and with lots of love for people, nature and quality products from regional manufactures, is using a mix of fabrics that she brings from her travels, micro modal from Polish weavers, organic cotton from Turkey and recently started using Lyocell. 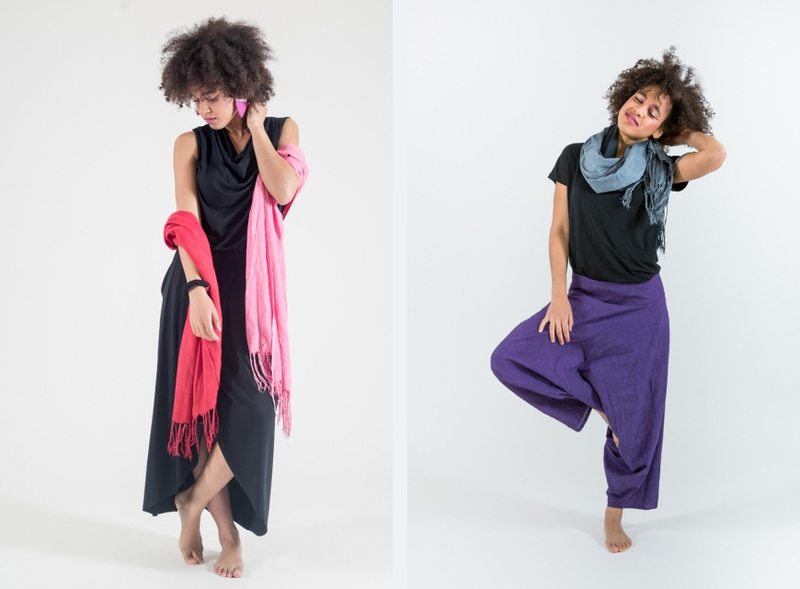 Since she freed herself from the collection rhythms spring/ summer and fall/ winter, she makes her developments independent from seasons, so a variety of styles are available in the store/ web shop year-round. Also makes sense, because there is not only the global north. Plus, her buying policies benefit from it: She uses what pleases and what’s available. If a fabric/ print is not available in sufficient quantity, she simply uses it for limited pieces only. Kokoworld is perfect for individualists who fancy wearing a genuine hint of exoticism and who want a story with their garment. A different story than the one nobody wants to hear: From people in precarious employment contracts and the cause of severe environmental pollution. Addis Abeba is not only Ethiopia’s capital, but also an extraordinary material: Cotton with colorful wax prints and the tie-dye-technique, simply called „waxes“ in Africa. 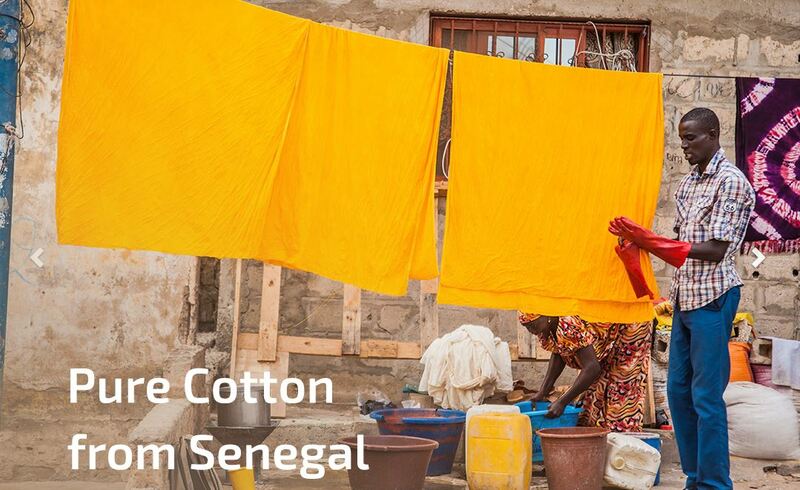 The method to dye textiles with wax reached Africa approximately 100 years ago, originates from Indonesia though. The multicolor patterns grew that popular in Africa, that they came to stay. 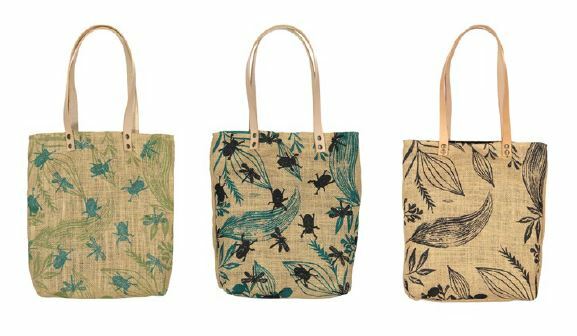 Buying articles from this collection also supports local craftsmen with whom Kokoworld works when developping new patterns and materials. 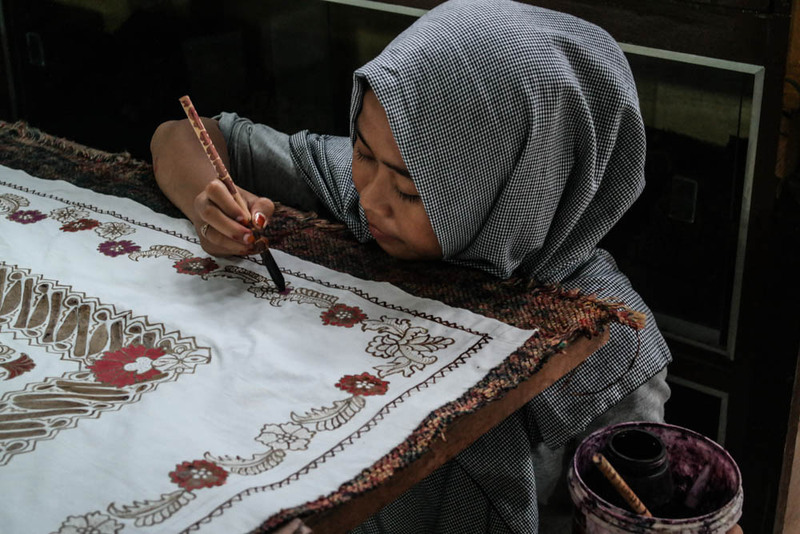 Monochromic pieces with details made of Indonesian cotton that is printed with traditional patterns called „KAIN ENDEK“. Each pattern is shown only once and will be applied in a different configuration for each application. Finally eye candy: Kokoworld did a photo shoot in Rügen. The island, known for its „chalk cliffs“ is said to be soon gone for good: Due to the steady rising of the water surface it is at risk of flooding! 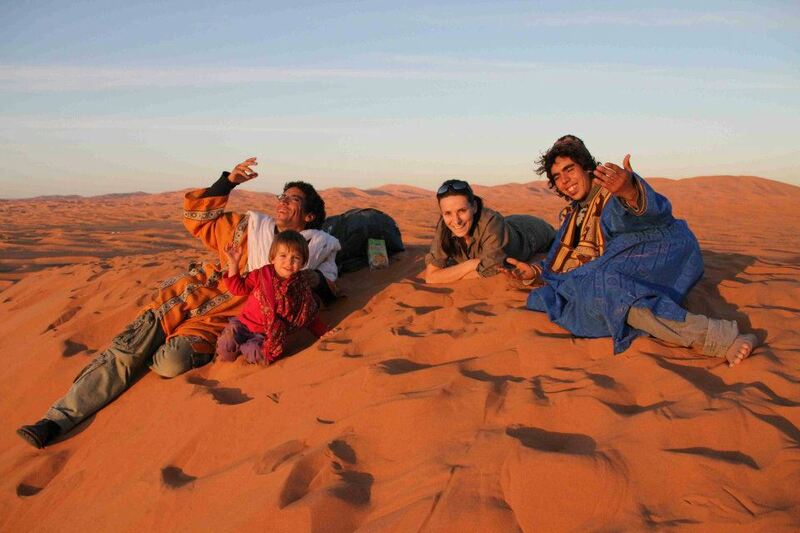 On occasion of this year’s World Environment Day the collection was staged in this endangered landscape. The result: Pictures that stick in the mind through their aesthetics showing both beauty and evanescence. The young biologist Sara from Lisbon committed herself to linen. Flax cultivation and processing has had a long but nowadays almost forgotten tradition in Portugal. It is her goal to revive this tradition. 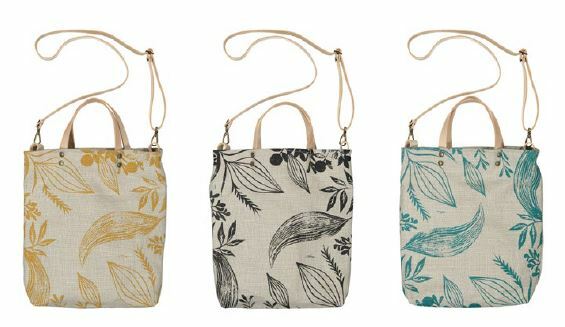 Thereby she creates products that are perfect for this sturdy material: Prettily printed bags. Besides the local linen she uses conventional linen that is cultivated and spun in France and organic cotton from India, both woven in Portugal. The plant based natural fibres are complemented with BUREL wool: It originates 100% from local sheep and brings with it all the advantages just as regular wool: It is water and fire resistant and only needs to be washed very rarely: Airing replaces the wash cycle in most cases! 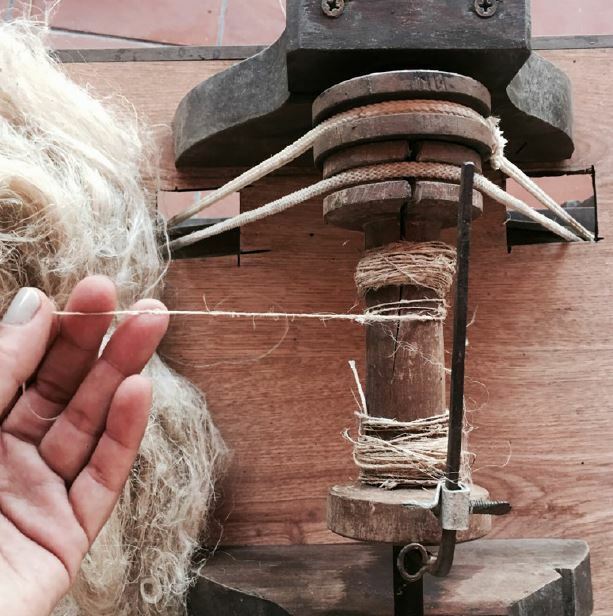 “It is one thing to make a basic rustic linen, even if completely handmade, and another one is this wonderful thing that Dona Maria das Dores grows and weaves. Her style recalls much of the traditional work from her region, but her approach to work has nothing to do with an unconscious repetition of tradition. We’ve talked for hours and she keeps repeating how her goal is to produce the “best work” and the “best cloth”. I don’t hear this as often as I’d like”. When talking to Sara I had the impression: Work ethics are high, the expectations on the own performance and that of the material too. 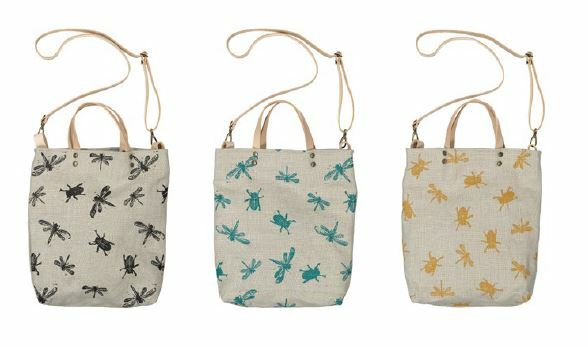 Sometimes I hear to biologist talk, sometimes the designer of the bags. Sara and Dona Maria in combination: The perfect match. It is the so-called Galego flax that is being used. A Portuguese strain that not only is used for the yield of fiber, but also of flax seeds. Besides a very small ecological foot print, the cultivation of this flax is transparent too, from the seed to the fabric. 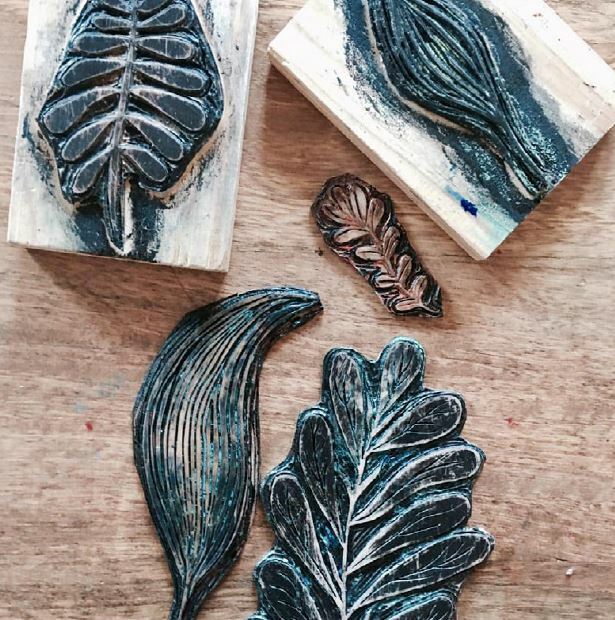 The gorgeous prints are made with hand-made stamps, with water based, ecofriendly textile dyes. As MAZURCA produces small quantities, each bag is individually made. By the way: If, despite the robust workmanship, some part gets damaged: The repair service is included with the purchase of each item. …for those being the main summer qualities of this Germany-wide, if not Europe-wide biggest eco-fair brand from Cologne. The collection is complemented by organic wool and linen as well as modal and recycled PET. During our discussion at the Premium fair booth I get the full info on the qualities. Here, unlike all other conventional brands, the distribution team knows the ropes. They even have in-depth info on the advantages of organic cotton other than „less pesticides“: Alternating crop rotation for the maintance of better quality soil (for instance with food crop such as millet) and organic fertilizer that is. 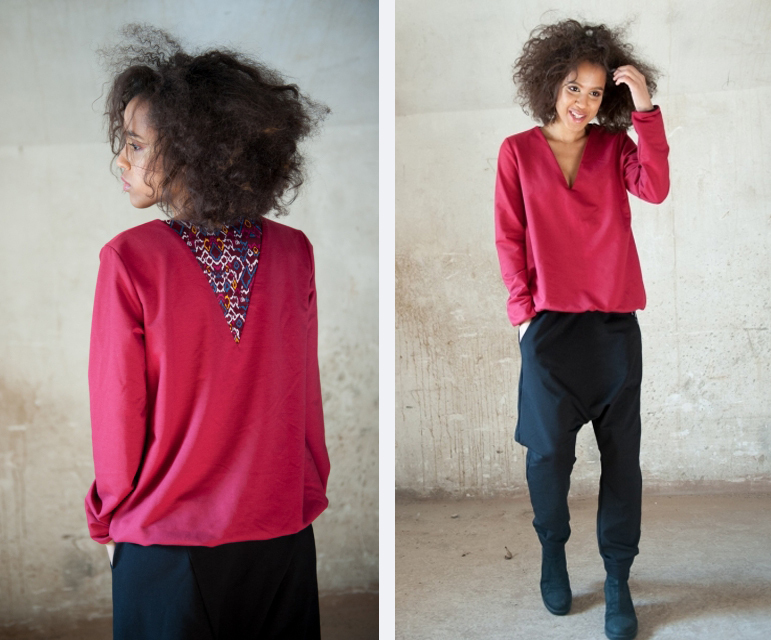 As I am checking the collection I am falling in love for the handfeel of the qualities: Tencel and modal are silky soft and super light, no worm has to loose their life for that. Moreover, these fabrics are being used in all kinds of structures, so these regenerated fibres don’t only come in a sleek surface, but also in an optically rough canvas structure on which colors come out extra nice. Plus, the qualities are not only nice, that I know from my own experience, they are also durable. FAIRTRADE stands for good labor conditions in the supply chain and for the usage of organic cotton, of which the most part comes from the cotton coop in India. In addition to that GOTS pits on the utmost ecological, sustainable and social requirements for biologically produced natural fibers. The FairWearFoundation completes the picture: They help to support suppliers realizing consistently good labor conditions for all employees. That way they ensure, that the desired standards are stuck to and further developped. Every customer who is interested in background info of a clothing label, likes a good story. No marketing gibberish, how „authentic“ everything is, but real stories with a potential of identification. And there’s galore at Armed Angels . 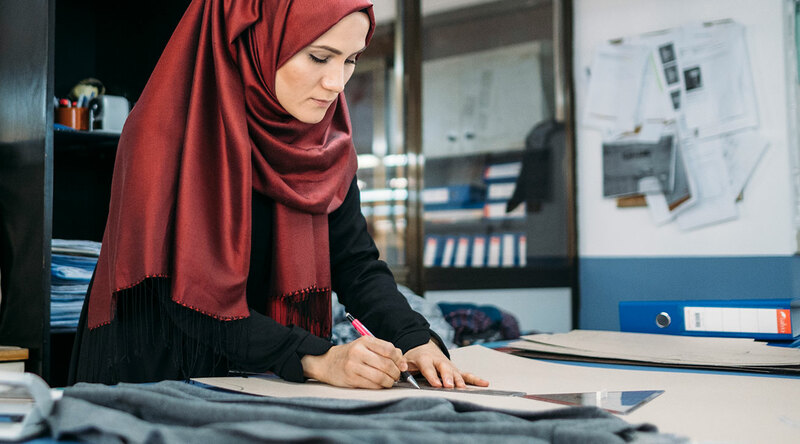 Filiz is a pattern maker and works for a GOTS certified factory where the workers call their boss „Father“. What she likes most about her job is, that she constantly creates new stuff and that she can physically hold the result in her hands. A special treat is seeing her product perfectly styled in a look book. She stands for justice and its a matter of honor that she stands up for it. And thanks to the decent factory MAY stand up for it. Since the 3-year collaboration of Armed Angels and the Turkish knit factory many things like the working hours code, salary and legal issues, health and safety and trainings have developped positively, more are to come and can be looked up at the web page. Needless to say that the knitter does not have a problem motivating his offspring to take over the company later: The grandson currently writes his final paper on green marketing. Good thing this is not a fairy tale faking authenticity, but best business practice.